This 2 bedroom apartment with shared pool is located in Benidorm and sleeps 4 people. It has WiFi and air conditioning. Company Tourist Registration Number - EGVT-998-A / Property Registration Number VT - 459486 - A. 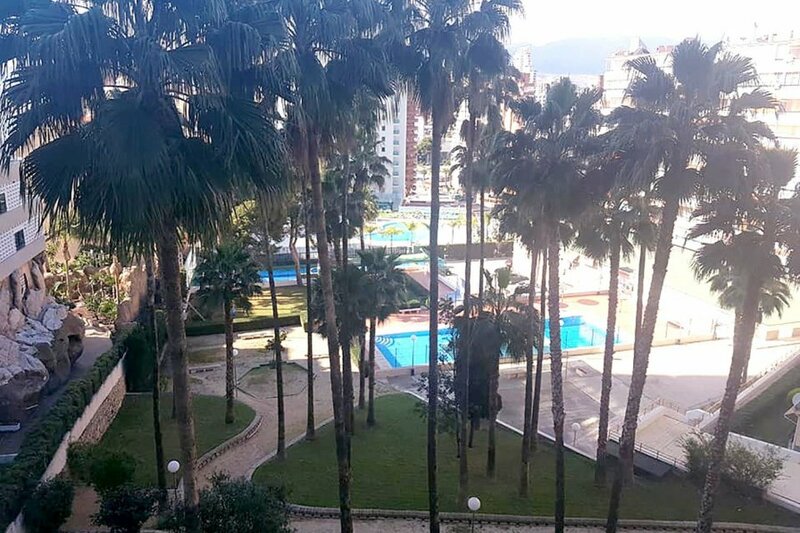 Take a look at this 2 bedroom holiday rental apartment located in the Rincon de Loix area of Benidorm. The reformed property is located in the Edf. Parque Loix Block 3, and sleeps upto 5 people with 2 Bedrooms, 1 double Bedroom and 1 twin Bedroom with additional sleeping arrangements of sofa bed in the lounge area. The apartment has a reformed fully fitted Kitchen with appliances, and one Bathroom with bath/shower . The spacious Lounge leads onto the enclosed balcony with pool and garden views across the complex. The property also has an open balcony, ideal for relaxing with pool and garden views across the complex. The apartment is well equipped for holiday rentals. Guests can access UK TV and WIFI included in the rental, air- conditioning at additional charge with 4 hours free usage per day. There are communal parking facilities within the complex, swimming pool * seasonal opening and tennis courts.